Emojis have become a staple of modern communication, with new characters released every few months, and one even being crowned the Oxford Dictionaries word of the year in 2015. But according to new research, we still have no idea what many of them mean. A new survey has revealed the most ‘confusing’ emojis, from the huffing face to the smiley with its tongue out, and just 1 in 5 people are able to describe them all correctly. Roughly 82 percent of Brits use emoji regularly, and 44 percent of people use them to clarify the meaning of their messages, according to the new research from online mobile retailer e2save. 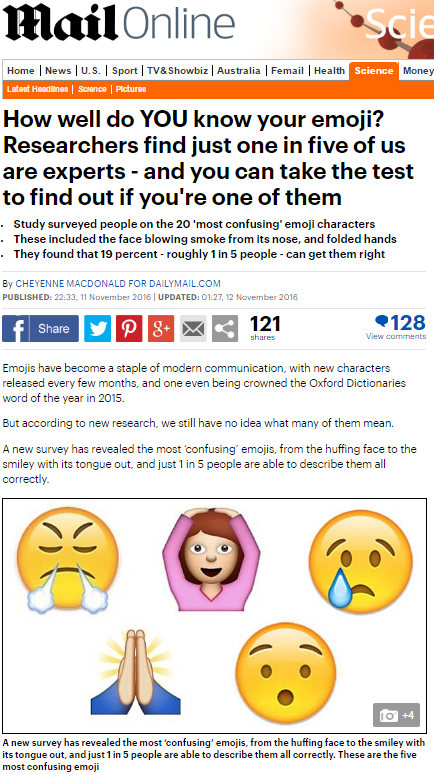 Even if the ‘research’ were true, or indeed were actual research, surely nobody makes decisions based on emoji, right? ‘Emojis are so popular nowadays that they are often a factor for people when it comes to deciding which handset to purchase,’ said Andy Cartledge, Marketing Assistant at e2save. Evidently the people selling us mobile phones do think we need careful, expert advice as to which mobile phone to buy. This entry was posted in e2save on November 24, 2016 by Michael Marshall.